During the dasara 'saranavaraatri' festivies 'chavithi' of the month of 'aaSvayuja' Mother Durga is decorated in the form of 'Sri Annapoornesvarii Devi'. Food is the form of God, food is the source of energy for every living being. The one who provides us with such food is Annapoorneswari. 'nityannadaneswari'(provider of daily food), 'Nitaalaaksha praaneswari, Annapoorneswari provides for not only for us, her children, but also to every living being. Hence helps in sustaning life on earth. The abode of annapoorneswari is Varanasi. The Lord of this land Sri Visveshswara's consort is the Godess Annapoorneswari Devi. Hence the name Kasi Annapoorneswari. Annapoorneswari is also one of the divine forms of Mother Durga. The reason for decorating the Godess in the form of Annpoorna is to inform of her importance. 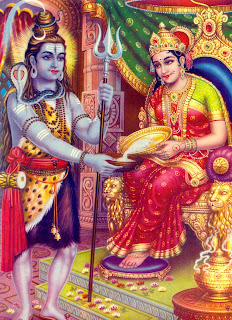 When her consort and the great God of destruction Maha Shiva also had to beg infront of her, and she had given him food. This is shown in the decoration. What we have to understand by this is that a Mother is always loving and caring towards her children. Every mother wishes to feed her children and she would go to any extrems to do that. Similarly Mother Durga transforms herself to Annapoorna to provide for her children. That is what pleases her. She is providing for her own husband as he comes begging to her, here all the human life is considered to be the forms of Shiva and thus Annaporna is providing to all living beings. When we have faith in her we inturn would become Annapoorna and will be providing for those who approach us with hunger. There is nothing more rewarding in the world than to feed the hungry. Hence amoung all donations donating for the hungry is more deserving. We have to see the importance of this decoration of Devi and be inspired to serve. We have to provide for the hungry and pray that Mother Annapoorna could make us sufficient in heart and mind to carry on her task as much as we could.